C. microcalyx is growing as an epiphyte, high up on a forest tree. This unidentified Columnea species was growing below eye level on a small mossy dead tree beside a forest trail in Costa Rica. When found, the plants tend to be widely dispersed with relatively few individuals per population. This may be somewhat an artifact of finding the plants. Since most species are epiphytes, meaning that they grow on the trunks and branches of trees to be able to get more light than is normally available in the rain forest understory, it is often difficult to see the plants unless they are growing on lower branches, have dropped corollas onto the forest floor, or are found in branches that have fallen or on uprooted trees. It is important to emphasize that epiphytes use their host trees only for a space to grow on. They are not parasites and do not tap into the water or nutrient supply of the host tree. 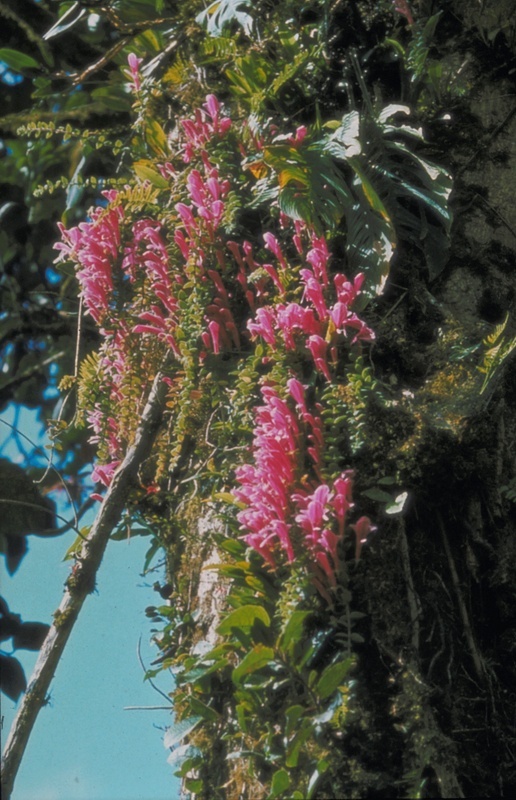 Since most plant collectors do not regularly climb each tree, it may be that the populations of Columnea species are much greater than what we see from the ground below. 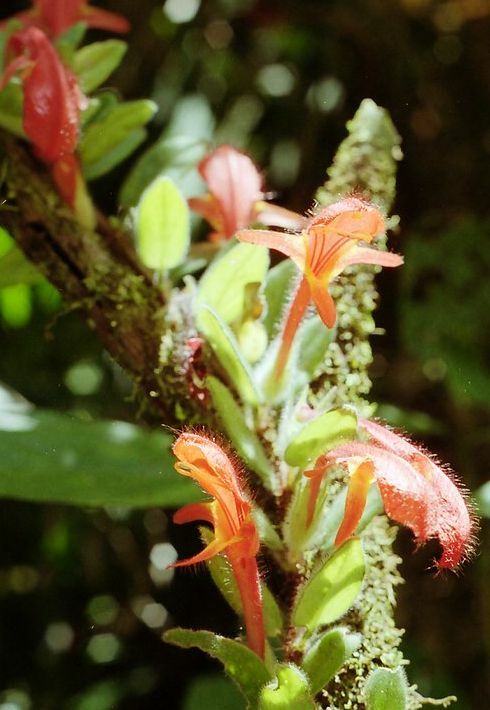 Researchers are beginning to study tropical forest canopies and the diversity of life that is found there, so hopefully in years to come we will have a better view of the true population density of Columnea species. Sometimes the only sign that there are Columneas in the vicinity is the sight of dead and fallen flowers on the forest floor. These were in the Rara Avis preserve in Costa Rica.